A Whole-House Fan pulls air into your home from open windows and exhausts it through your home's attic and roof. 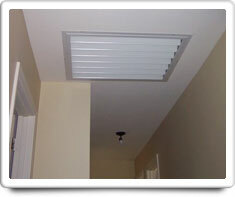 It provides good attic ventilation in addition to whole house cooling. Using a Whole-House Fan can be used in place of an air conditioner for much of the year in most climates. However a Whole-House Fan should not be confused with an attic fan, which also can be located in the attic. But an attic fan just circulates air from the attic, not from the living space of the home. Shown in the 'Routine Care' section are the recommended routine maintenance tasks for your whole house fan. The 'Q & A' section shows answers to common questions. And the 'Articles' section provides helpful articles about your whole house fan.